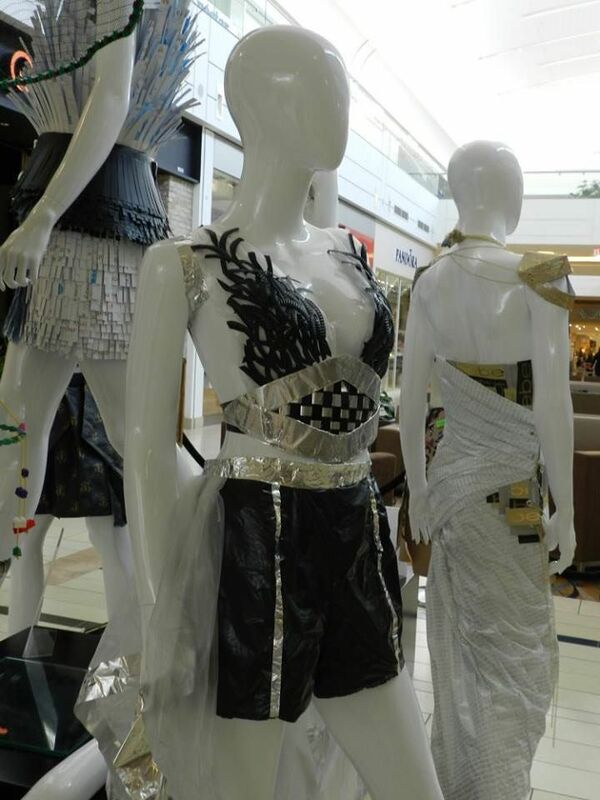 The most talked about garments at the Northshore Mall are fun, fashion-forward and – made of trash? That's right! 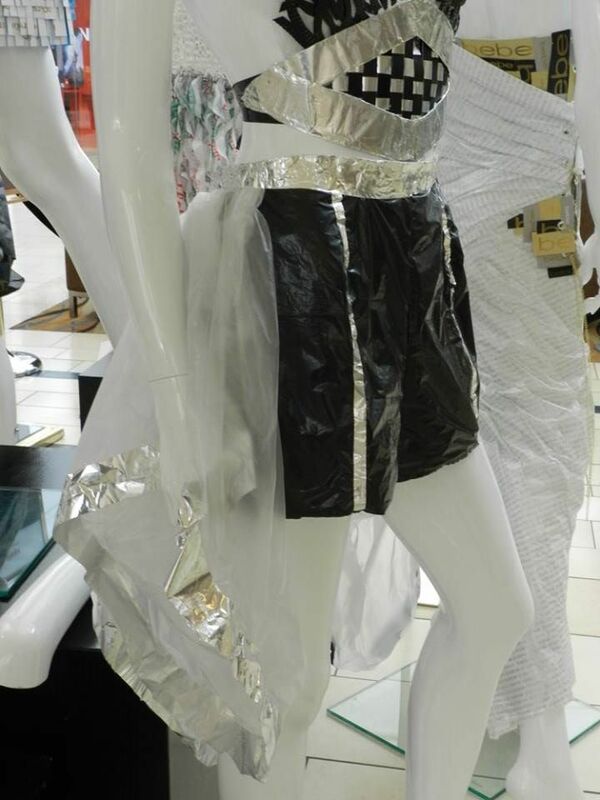 This year, Bay State College Fashion Design students partnered with restaurants and stores at the Northshore Mall to create original garments made entirely out of donated, recyclable products. We sat down with Hannah Richardson and Laurie Warden to learn more about what went into making these incredible creations. 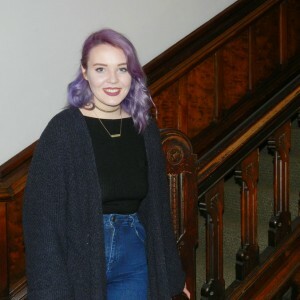 First, get the inside scoop about Hannah's work in partnership with Not Your Average Joe's. "I was one of the last people to pick [my partner]. Not Your Average Joe's wasn't my first choice, but I picked that one because I figured it would be a challenge." "All of the materials we got from them were things they over-ordered or things laying around, which resulted in a lot of cool things that we could do. I received the plastic bag it came in, to-go containers and to-go lids." "I was one of the last people to get started working on my project because I had no idea what I was going to do with it! I didn't have a color palette to work off of because everything was black and clear. I started cutting things up, burning things, melting things, seeing what would work." "When you're working on it, you have to keep in mind that cardboard and plastic do not fit the body very well. But if you get it wet or melt it down, then it's going to fit better. We all had to try and figure out what our materials could do to fit the body." "One of the little bowls I got I started cutting up into little spirals, and that's how I got the effect for the top. I had originally draped the clear plastic bag for the top, and it was completely see-through. You can't exactly have a completely see-through top! So I saw all the plastic pieces I had cut up and started hot gluing them on in a pattern. Then the hot glue would melt the plastic, so I'd have to figure out something else to use. I think figuring out which adhesive to use was the hardest part." "I definitely found a new interest in appliqué. I've played around with it before, where you take lace and sew it on sheer things to create a silhouette, or the illusion of a silhouette. I wanted to try that with the plastic so it looked like the little pieces of plastic aren't stuck to anything – that's just what the top is. I definitely got better at that skill." "I ended up deciding on shorts because everybody else was doing a dress or a skirt and I didn't want to have the same thing. So I took muslin and made shorts out of it, then I took a black plastic trash bag and sewed it on to the shorts. That made it a little bit more comfortable, so the plastic wasn't touching your body. Then I had to bring some sort of color into it, so I used metal [tin foil] tape for a splash of color." "I had more of the same clear plastic bags I had used for the top, so I started playing around with those. The opening I lined with metal tape and stuck onto the shorts to see if I could make a sort of skirt out of it." "I was expecting it to be a lot easier than it was. You think- 'Oh, I can just cut it up and stick it on something, it's no big deal'. But actually trying to look at this pile of garbage and say 'I can make a dress out of this' is a lot easier said than done." "I think people do want to recycle, and they're just realizing how big of an impact the fashion industry can have on the global environment." You can see this garment and others like it at our annual student-run fashion show! 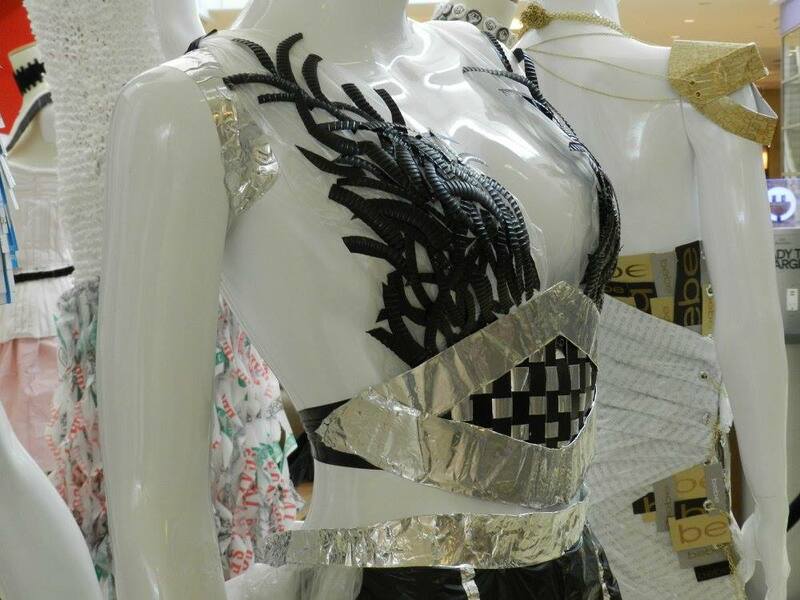 This year's theme is Greenhaus Couture and is all about recycling, reusing and repurposing. Admission is free. Join us Sunday, May 7th from 6:00pm to 8:00pm at the Galleria, located at 10 Saint James Avenue in Boston.